Crypto space is overflowing with enthusiasm and hope, Bitcoin has been instrumental in spreading knowledge about crypto currencies. Hopes are often high and many newcomers expect to make a million dollars in a very short while. There was a time not so long ago when, Bitcoin was equated to the crypto world. The November – December 2018 slump in the price of Bitcoin, proved extremely shocking for crypto markets. The 2018 lessons for the crypto community have been painful but constructive. Crypto analysts and seasoned crypto traders saw how, the fall of a single crypto (BTC) could pull down the entire crypto market. The good thing about the Bitcoin slide is that, crypto operators have realized that, it would require not one but many, cryptos to develop a stable, robust and profitable market for crypto currencies. So is this the right time to pick a few crypto currencies, what is the right strategy. Cryptos are growing in popularity, the variety and range of cryptos have shown an impressive expansion. It was not so long ago that, Bitcoin seemed to be the only crypto worth buying – that if you had something in the range of $4,000 to $10,000 to spare. And of course even that money, got you just one single BTC. Crypto buyers now have a range of cryptos to choose from, these conver a range of prices to suit every budget and every risk level. This is a nice time to buy a few cryptos, but a thorough evaluation of the project would be advisable. There is no reason to believe that, high priced cryptos are good and that, low prices cryptos have lower potential. Projects that flaunt nothing more than a crypto, are worth leaving aside. 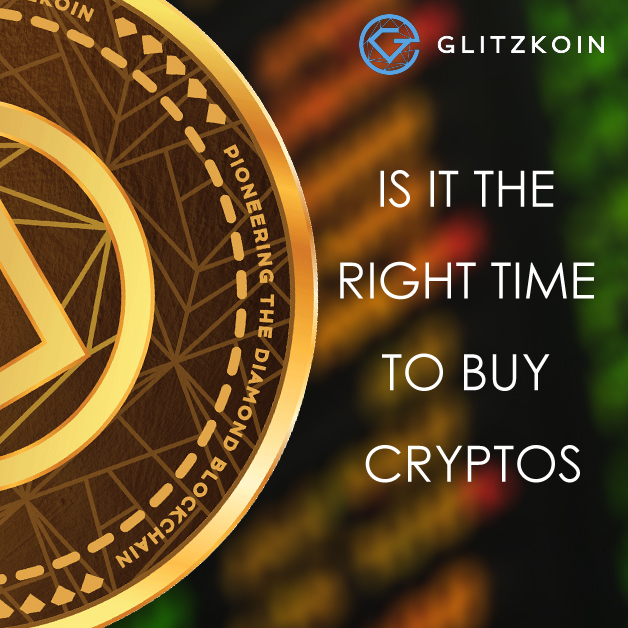 While GLITZKOIN will not encourage you to speculate on crypto currencies, the fact remains that a significant proportion of buyers spend with the aim of speculation. At the very basic level, you need to be as diligent as you would be when, buying conventional stocks or shares. Don’t spend too much and do not buy with the dream of becoming an instant millionaire. The crypto world is new and you should take your time to fully understand it. If you make a purchase at a high price even a small fall in price, can result in a painful loss. A good example would be to compare the percentage price movement, between the Glitzkoin GTN token and Bitcoin. Let us lock in the July to December 2018 period for comparison purpose. Bitcoin at one stage, lost about 50% of its value when, it slid down from $7,000 to $3,200. Holding even a single BTC meant that, you were hit with a substantial loss of $3,800. On the other hand Glitzkoin marched, against the depressed market and recorded a 50% gain in the GTN value. The price of the token moved up from its ICO price of $0.20 to $0.30. When allocating a budget for crypto purchases, spread your money over a range of cryptos. If you wish to be very conservative, spend only as much as you can lose. You don’t want to put a big strain on your finances. The GLITZKOIN team did an in depth analysis and found that, most crypto currency projects are initiated solely with the objective of issuing the currency. Such projects do not have depth and would generally run into rough weather. If you do want to spend on such projects, keep the spending low. The GLITZKOIN project has a two pronged approach to reap the benefits of the crypto world. The GTN token launched as a part of the project, trades on crypto markets. It is currently listed on Stellarport, negotiations are ongoing to have the token listed on other crypto exchanges. The project includes a diamond exchange nicknamed, DiaEx. The exchange facilitates B2B and B2C trade in diamonds and is designed to use, the GTN token as the mode of payment. This report would not be complete without talking about ICOs, Initial Currency Offerings. Blockchain projects generally commence with an ICO, a process that allows the project to collect funds to be used to develop the project plan. This is generally the time when, prices are fixed at moderate levels. So should you buy a crypto during the ICO phase. It should be said that ICO and post-ICO purchases, have their own advantages. Some explanation on issues involved would be useful. The number of projects launching crypto tokens, has shown a significant increase. Unfortunately, many of these projects have shown little progress after the completion of their ICO. This has encourage crypto enthusiasts, to deal with ICOs with a bit of suspicion. The advantage of buying cryptos post-ICO, are quite convincing. It is possible to review the progress of the project plan before, making a buying decision. Token purchases at this time would be made through a crypto exchange. This also means that the tokens could be sold as and when required. The age old recommendation that says ‘… not to put all your eggs in one basket ‘, you might want to spread your crypto currency buys. Spread your purchases across different cryptos, you could include ICO and post-ICO crypto purchases. Just make sure that, you spend time reviewing each project in its entirety. Glitzkoin: Leading the new breed of blockchain projects, that are directly connected to a real world business or industry, the Glitzkoin project and GTN token make an awesome case study. The project is focused on improving efficiency and market scope for the $90 billion diamond industry. It includes a comprehensive diamond trading platform, DiaEx. The GTN token is the designated mode of payment on the DiaEx platform. The Glitzkoin ICO was conducted from March to June 2018, the GTN token was priced at $0.20 during the ICO. A thorough project plan impressed seasoned crypto participants. They actively supported the ICO and continue to do so, after its completion in June 2018. Listing on the Stellarport exchange for the GTN token was completed in July 2018, significant trading in the token has happened since then. It was the November to December 2018 period when, crypto markets recorded huge losses – pulled down by the slump in the price of Bitcoin. Crypto buyers seemed to favor the Glitzkoin GTN token during the slump, the token hit the $0.30 level. This was a clear 50% rise, as compared to the ICO price of $0.20.